Plug in and light up your outdoors. Conveniently illuminate and personalize your outdoor space, tune the light level to your need of the day, creating the right ambiance to fully enjoy your moments. Outdoor spot light. 700 lumens per each Spot. Suitable for use in wet locations. Highlight the beauty of your garden or use when entertaining or relaxing. Play with 16 million colours to tune to the right moment and occasion. 2200K - 6500K. Includes 1 Spot, 1 x 5m extension cable, 1 connection, 1 spike and wall mount. Hue White and Colour Ambiance Lily Outdoor Spot Light Single Extension - Black Finish Plug in and light up your outdoors. Conveniently illuminate and personalize your outdoor space, tune the light level to your need of the day, creating the right ambiance to fully enjoy your moments. Hue White and Colour Ambiance Lily Outdoor Spot Light Single Extension - Black Finish is rated 5.0 out of 5 by 1. 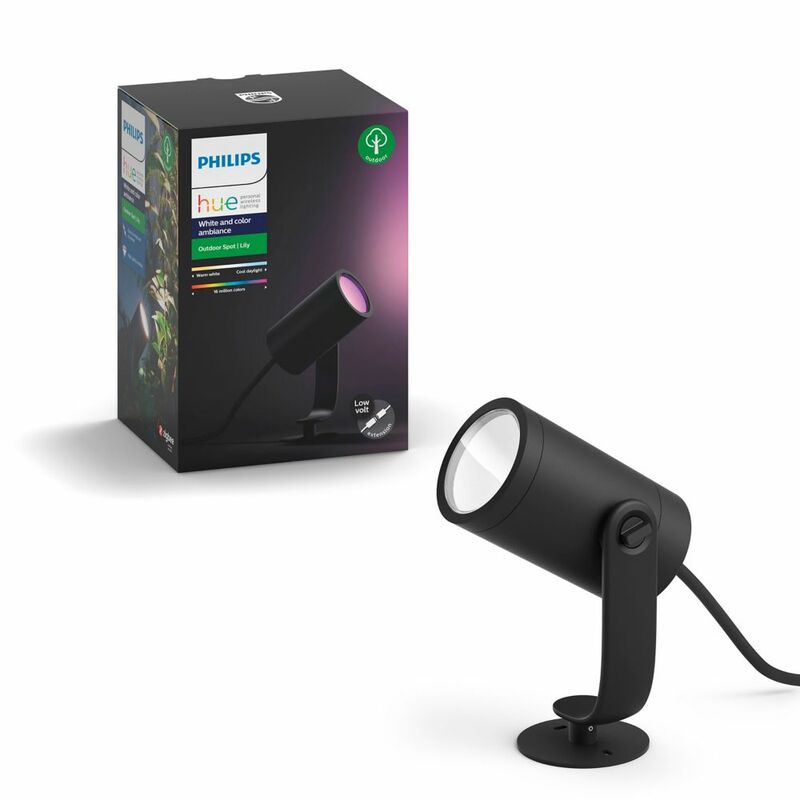 Rated 5 out of 5 by Ceriess from Using the 3 light starter set and 2 additional lamps... Using the 3 light starter set and 2 additional lamps I mounted them on our pergola as down lights and was able to do it in such a way that the cables are largely unseen. Our outdoor seating area is much nicer as a result. I really like these lights.